- Easily removes swirls, scratches, and defects from all painted vehicles. - Applies wax, sealant, and glaze in minutes. - Developed for professionals using heavy-duty construction. - Easy-to-use features for any detailing enthusiast or professional. - Ergonomic design with streamlined controls for maximum comfort. - Delivers the ideal power needed at low speeds, high speeds, and everywhere in between. - Balanced internal design for precision paint correction. - Lightweight construction with vibration reduction technology. - Electronic User Interface (EUI): Digital display and speed control buttons for precise and intuitive control. - Precision Power (P²): Smooth power delivery and start-up function. TORQ® set out to develop a tool everyone would enjoy and understand: a streamlined machine with the power and precision demanded by professionals combined with simple design and use sensibilities for any enthusiast. The TORQ® 10FX Random Orbital Polisher redefines the state of the art by delivering a machine that is precise, accurate, smooth, powerful, and ergonomic. The TORQ® 10FX is the benchmark product that is the ideal choice for professional detailers and enthusiasts alike. The TORQ® 10FX Random Orbital Polisher is a revolutionary polishing machine designed to perform any job using precision technology. To create the TORQ® 10FX, engineers blended Precision Power (P²) motors and gears with an intuitive digital User Interface (UI). The result was a machine with superior Harmonious Balancing (HB), and an unmatched smooth user experience. No other machine on the market combines the power, smoothness, and intuitive ease-of-use of the TORQ® 10FX. Easily polish paint to remove swirls and scratches from any painted surface. Quickly apply wax, sealant, and glaze to any size vehicle in minutes. TORQ® engineers designed the 10FX Random Orbital Polisher to remove swirls, scratches, and paint defects with incredible speed by using the perfect throw design. The advanced vibration reduction technology allows the user to work longer with minimal strain. The TORQ® 10FX features a unique digital control system that creates the perfect speed to polish any vehicle while giving a smooth start-up and engagement. 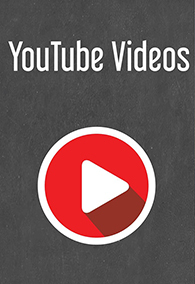 The easy-to-read digital display gives the user clear information about speed settings. The TORQ® 10FX deliver the ideal power needed at low speeds, high speeds and everywhere in between. The innovative random orbital polisher is constructed using the highest quality build materials to last for years of detailing. The TORQ® 10FX is the state of the art machine that is the ideal choice for both professional and enthusiast detailers. The durable, solid, and lightweight construction of the TORQ® 10FX will last for years. 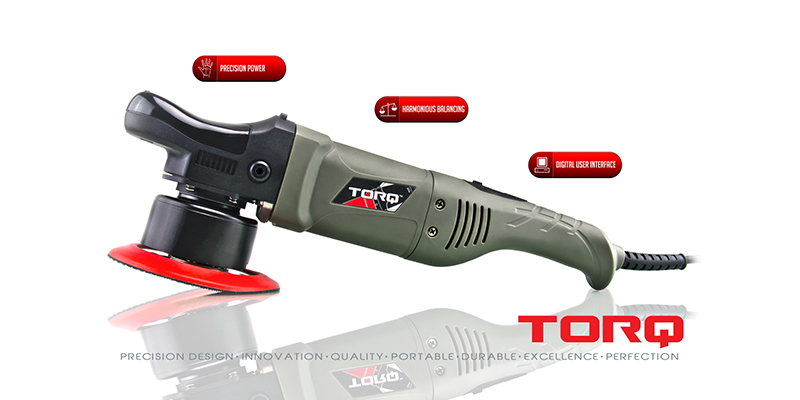 The TORQ® 10FX Random Orbital Polisher: Tomorrow’s Detailing Tool, Today! The TORQ® 10FX Random Orbital Polisher takes detailing to the next level. Utilizing the 8mm throw that professionals and enthusiasts have used for decades TORQ® combined it with the latest innovative technologies to create a revolutionary polishing machine. The TORQ® 10FX is designed with the power to tackle any job, big or small. Not all surfaces require a large throw to achieve perfect results. The TORQ® 10FX combines the ideal throw size with the speed and power necessary to rapidly correct imperfections. The TORQ® 10FX uses a random orbital design to quickly correct paintwork with incredible precision. The random orbital mechanism replicates the motion of the human hand to safely achieve perfect results, every time. The TORQ® 10FX Random Orbital Polisher is designed with built-in safety features that prevent the user from damaging or burning paintwork. The mechanical safety features stop the machine from spinning on sensitive areas like edges and dramatic contours. The TORQ® 10FX Random Orbital Polisher can also be used to scrub carpets and upholstery, or apply waxes, sealants, and glazes making the machine extremely versatile. 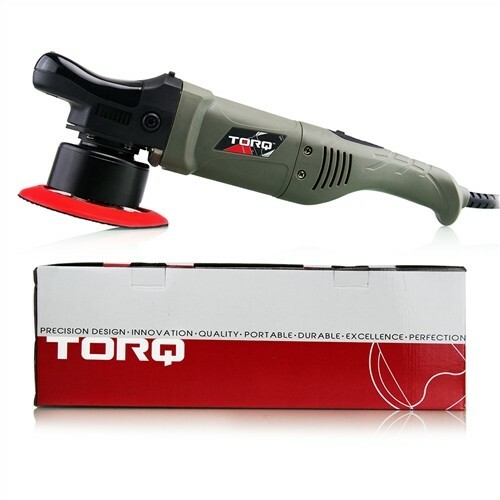 The TORQ® 10FX Random Orbital Polisher be used with used with 4”(100mm), 5”(125mm) and 6”(150mm) pads to detail any size vehicle. Electronic control systems smoothly increase power upon startup to reduce wear and tear on the motor and internal components. The built-in Precision Power (P²) controller precisely delivers power to the motor, and gradually speeds up as you adjust speed settings. This clever adjustment takes only a fraction of a second, yet greatly improves the life of the motor and moving components, and reduces the possibility of slinging product off the pad of the machine by managing the influxes of power gradually. The digital User Interface (UI) system gives the user the smoothest operation of any polishing machine on the market. The UI controller gradually increases the speed of the machine, making the TORQ® 10FX Random Orbital Polisher easy to handle for any user. The TORQ® 10FX Random Orbital Polisher gives the perfect speed, control, and accuracy to perform to the highest level on any job. Smart Digital speed control module powers the TORQ® unit, while the digital screen notifies the user the machine is on. Onboard digital speed adjustment buttons provide accurate and precise rotations. 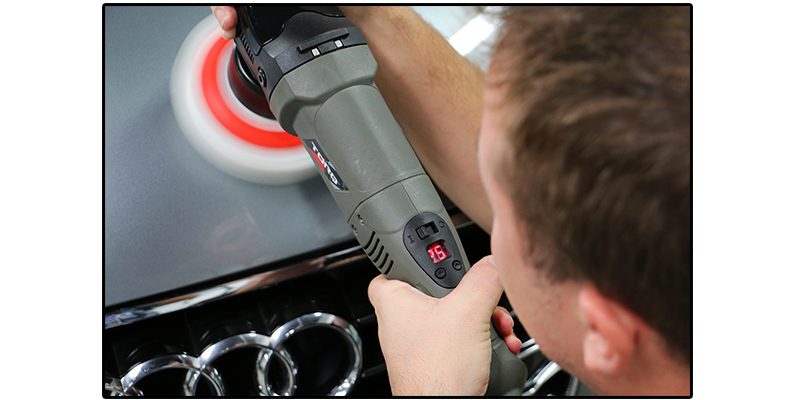 The easy to read digital screen clearly shows the speed of the machine, making polishing safer, easier, and more fun for detailing professionals and enthusiasts alike. TORQ® engineers designed the 10FX Random Orbital Polisher to work with the user, not against them. By designing a machine around the user, TORQ® crafted the user interface to be as easy and user-friendly as possible. On-board digital controls and display deliver ideal comfort, ease of use, precision, accuracy, and improved safety. The streamlined digital display and power controls are ergonomically integrated directly above the hand grip, all within thumb’s reach. TORQ® 10FX power controls are extremely intuitive, making it comfortable and easy to control speeds without ever taking your hands off the machine or eyes off the paint. The intuitive design keeps your eyes and attention on the job for improved safety and faster results. The streamlined and ergonomic design of the TORQ® 10FX deliver the most comfortable polishing experience possible to the user. Work smarter, not harder! Vertical surfaces no longer pose a problem when working with the TORQ® 10FX. 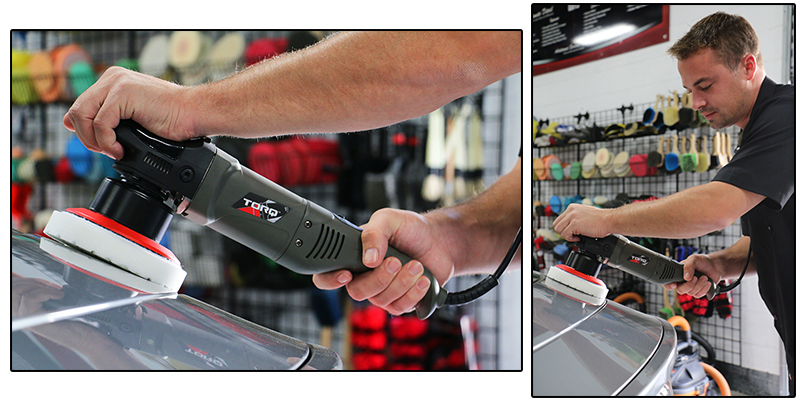 The streamlined ergonomics of the TORQ® make it the ideal detailing tool for detailers and enthusiasts of all levels. Designed with the user in mind, the TORQ® 10FX can be held comfortably by left-handed and right-handed detailers alike. The TORQ® 10FX Random Orbital Polisher is designed using vibration reduction technology to improve the comfort when polishing. The internal case absorbs unwanted vibrations, which reduces fatigue when detailing for long periods of time. The ideal weight distribution creates the perfect harmony of man and machine for a truly fantastic detailing experience. The TORQ® 10FX Random Orbital Polisher is designed with the user’s safety in mind. The controls of the machine are easy to reach, perfect for any size hands, and intuitive enough to adjust without losing focus on the task at hand. The digital speed controls are comfortable to use and easy to change speeds at the simple touch of a button. The TORQ® unit turns on at a speed setting of 0 meaning ZERO rotations. This added failsafe feature is to reduce human error and injuries that may occur in use. The TORQ Smart Digital speedometer and display is designed to keep the user aware of the speed at all times. The improved features enable the user to keep complete control of the unit without the need to reach controls or power switches. Keeping your attention on the job is the most important feature for any detailer. The TORQ® 10FX is the tool designed for the people. Anyone can use the TORQ® 10FX Random Orbital Polisher with ease and comfort. The body is engineered to be perfectly balanced in the hands for the optimal performance in any position. The TORQ® 10FX Random Orbital Polisher is designed just for you.